This chapter discusses the issue of standpoint in sociological discourse as well as in the dynamics of social life. It begins with a discussion of the work of André Béteille, creative social theorist from India, about the plurality of standpoints in the sociological discourse of society as well as in social dynamics. Béteille has consistently been a champion of a plural approach in the study of society, but his discussion of plural standpoints raises further questions which call for further collaborative search and reflections. For example, what is the nature of standpoint in these plurality of standpoints—is it partial or absolute? Do these different standpoints communicate among each other? Is it a responsibility for sociology to understand and contribute to communication among plural standpoints? The present author thinks the same as Béteille on these questions and discusses further the challenge of pluralization that emanates from Béteille’s reference to plurality of standpoints. 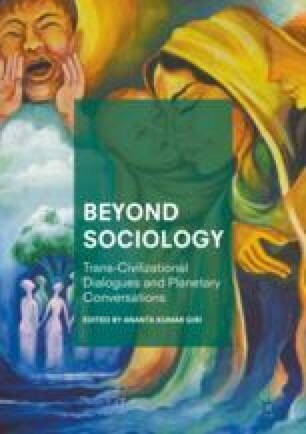 The issue of the relationship between sociology and theology as between sociology and ideology is discussed. This is followed by a discussion of the issue of empirical and normative aspects of social reality, and the author argues that sociology needs to go beyond the dualism of the empirical and normative in order to understand the normative strivings and struggles at work in the very heart of social reality itself.